Two of the nominations for Best Independent Company at the recent National Dance Awards were for Ballet Black and the Mark Bruce Company. The former had won the inaugural award (as well as earlier recognition as the Outstanding Company of 2009) but on this occasion it was Mark Bruce’s hands that took hold of the trophy. And so in Second Coming, here was also a coming together of two of the pre-eminent talents on the UK dance scene with the irrepressible Cassa Pancho commissioning Bruce to step outside his own company and make a work for Ballet Black, the brand she has led since it was founded some 14 years ago. It promised to be an irresistible fusion of talents and so it was. Second Coming illustrates a fantasy world of an unnamed divine ruler, assisted by an Angel, who governs a land of savages, one of whom bears the ruler a son. In Bruce’s telling, it isn’t so much a tale as a landscape: one where the old foes of good and evil, of mortality and divine right are envisioned in a potpourri of great dance, a brilliant soundtrack and spectacular costumes (designed by Dorothee Brodrüeck). Bruce’s musical compilations are intuitively right in terms of creating the perfect environment for his choreographic ideas. This one – as is customary – contained three of his own compositions enclosed within an eclectic score that ranged from Elgar’s Cello Concerto in E Minor to a Bond Theme (You Only Live Twice, sung in a memorable arrangement by Mark Lanegan) and performed in recordings by a mixed bunch that includes Jacqueline de Pré, Tom Waits and André Rieu. I imagine that it takes Bruce longer to choose the music than it does to make the steps. It has become the norm for each Ballet Black season to showcase a new one-act ballet that utilises all its dancers (once just six, now grown to eight), which is building a distinctive repertory of substantial works by some of the best choreographers around. 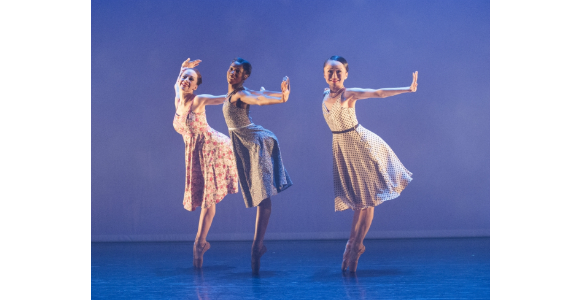 While showcasing new work is at the core of the company’s mission it is also good to bring back rep from former years as was the case with Will Tuckett’s Depouillement (made for Ballet Black in 2009 and no doubt part of the reason for the critics voting it as Outstanding Company for that year). I well recall feeling enriched by the stripped down abstract form of this work when first seeing it at the Hackney Empire and it has lost none of that power and charm. Tuckett is also a choreographer to whom music is the fundamental starting point (who can forget his interpretation of Kurt Weill’s music in The 7 Deadly Sins, mixing the dancers of the Royal Ballet with Martha Wainwright singing live on stage). The ostentation of that “sung ballet” set in the decadent ’30s is, however, a world away from the economy of means (Depouillement) that puts the bare emphasis on pure dance as a counterpoint to the minimalism of Ravel’s Sonata for violin and cello. It is a beautiful work, made in an ascetic aesthetic, a puritanical vessel stripped of any ornamentation but nonetheless ravishing for all that austerity. Watching Cira Robinson perform in Depouillement, I found myself longing to see her dancing in George Balanchine’s Agon or as Terpsichore in his Apollo. A petite ballerina, Robinson is not at all made in the physical mould of a Balanchine muse but she has all the other attributes (attack, beauty, charisma, balance, vivacity, intuitive musicality, powerful physicality) in spades. Together with Damien Johnson, these two long-serving American members of the Ballet Black team (both arrived in the UK by way of the* Dance Theatre of Harlem*) provide the company core of performance maturity, around which younger dancers can settle. Two of these, Kanika Carr and Jacob Wye (both of whom having graduated into the company from the role of apprentice), performed the opening duet, Kit Holder’s To Fetch a Pail of Water It was a slight but effective hors d’oeuvre and I liked that David Plater’s lighting design created the illusion of a hill for this Jack and Jill. Holder’s concept of exploring the coded meanings in this well-known nursery rhyme presented an intriguing ten minutes of dance. Carr and Wye make an attractive and engaging couple although on this press night they were a little too obviously self-conscious about their placements and partnering. It takes very hard work to keep coming up with successful programmes of largely new ballets on a regular, unbroken basis, both behind the scenes and on the stage. This would be true of any big company but how much more so must it be for a small ensemble such as this. Time and again, Ballet Black programmes show a little company with a large sense of theatre. These dancers have impressive physicality and a leader with an all-seeing and unerring eye.